One of the benefits of living in the DC Metro area has been the wealth of free things to do on the weekend. We’ve been trying to fill in the gaps these past few weeks, doing the things we hadn’t yet done while we’re still here. 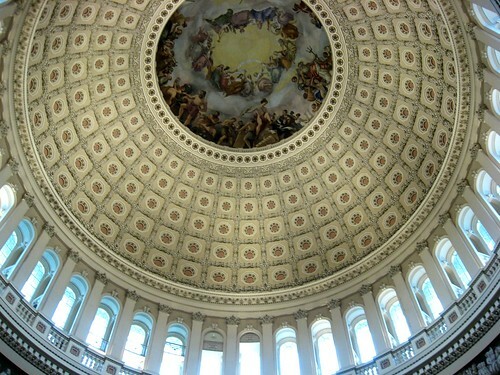 So we finally went on a tour of the Capitol Building. It used to be that you would have to write your Congress Critter for tickets to the tour, but these days you can just sign up online! And while the Capitol Dome really is quite pretty… if you’re more interested in the politics of the Capitol instead of how a state gets a statue into the building, this may not be the tour for you. We learned about the paintings. We learned about the statues. We learned a liiitle about the history and architecture… But even though neither body was in session, all we got to see was a movie and some dome shaped rooms with statues in them. Pretty rooms. Pretty statues. But not really my cup of tea. After that, we headed to the National Botanic Garden, not to be confused with the National Arboretum (Although if you really like Bonsais, the Arboretum is a must see). The greenhouse really does, oddly enough, seem bigger on the inside. There’s the jungle room (pictured), but also cacti, medicinal plants, a children’s garden, and a room full of orchids. 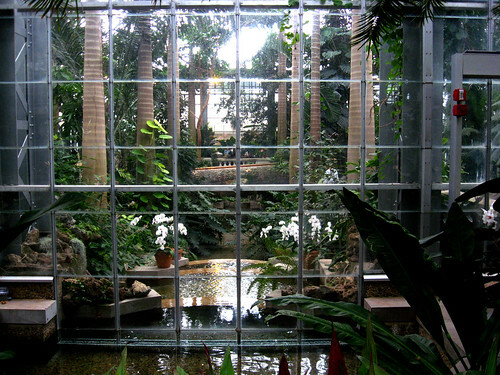 It was much busier than the Smith greenhouse, so I wouldn’t go there for quiet meditation, but I would bring your camera. It’s gorgeous and warm and very green. Then we made the small hike back up the hill to Good Stuff Eatery. This is probably my favorite burger place ever. Sure, I’m a little biased because I like Top Chef, but it’s not as if Spike was one of my favorites during the competition–I like him a lot more since. And the burgers aren’t very photogenic. They’re just good. What’s my favorite thing here? Every burger I’ve tried. Pictured here is the “Prez Obama Burger”, with bacon, blue cheese, and an amazing red onion marmalade. The Coletti’s Smokehouse is also amazing, with bacon, cheddar, onion rings, and bbq sauce. I also love the Chili & Cheddar (self explanatory). And those are just the ones I can’t stop thinking about. They do have more standard burgers. They do have a turkey burger, and a veggie offering. But this is not a place that encourages you to mix and match whatever it is you might want like most places around here. This is about a carefully constructed list of robust and even sometimes delicate flavor combinations created by a chef that really seems to care about them. They look squishy and messy, and that’s because they are, but they’re so good. But even better are the shakes. In my lactardedness, I have a very distinct sense of what is worth taking a box of lactaid and what is not, and it is not often that I go crazy. But these shakes? OH-DEAR-LORD. The toasted marshmallow actually comes with a toasted marshmallow on it. 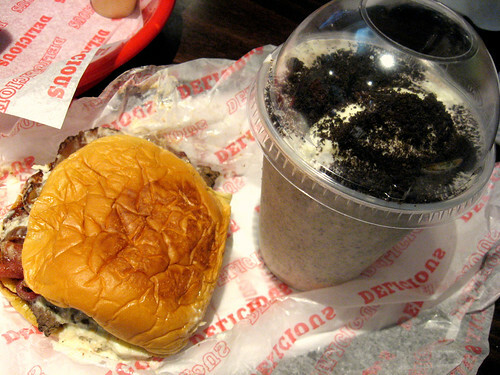 The Cookies&Cream shown above, a seasonal shake, has got me on a Cookies&Cream binge. And the MilkyWay, and the Black and White (which seems to be Vanila with Fudge Sauce)…. They’re so rich and overwhelming for lactards that my boyfriend and I split the Kid Sized one. But OH we enjoy it. The fries and onion petals, while good, often suffer the effects of an overcrowded frier. I still keep ordering them, though, because even if they’re not as crisp as they might be, and even if the onion petals get stuck to each other, they are the best vehicle for the various mayos offered. I might eat the mango mayo with a spoon if I thought no one was looking. Between being Top Chef related, being very close to the Capitol and Library of Congress, it’s a hot spot for tourists. Being so close to the Congressional office Buildings, it’s a hot place for staffers. So there are lines sometimes. Quite a bit, actually. I recommend going when Congress isn’t in session, and not during super peak tourist times. And to make it worse, they’re closed all day Sunday. But even when they’re busy, this is where I bring friends from out of town. Spike is often there, working the line, although not quite as much recently, as he’s trying to open a new place, We the Pizza, next door. It may even open some day, although the opening date keeps getting pushed back. I’m sad we’ll miss it. And I will definitely miss Good Stuff when I move back to Boston.